Once applying the solution(s) the Activate button turned to be Enabled now. Great!! In this article I would like to take you through a real-world problem. 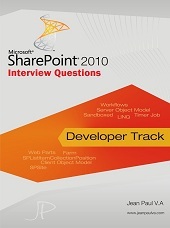 You are working on a Java Script method which should be deployed to multiple SharePoint servers. The Java Script needs to be included in the Master Page file. The manual deployment requires going to each SharePoint site, Opening the page in SharePoint Designer & Editing the master page. This way is time consuming & has maintenance overheads. We need to automate the deployment process. We can use the AdditionalPageHead delegate to render our custom code to master page & everything through automated deployment. Open Visual Studio & Create an empty SharePoint project & name it as MasterPageCode. Choose the farm solution option. Now we need to include this user control code in the Master Page. We can achieve this in the next step. Choose Add new item & select the Empty Element option & name it as MyAction. Now right click on the solution & choose the Deploy option. Wait for a few seconds & your solution will get deployed & activated automatically. During runtime, the Java Script code will be appended to Master Page. 1. The default master page of SharePoint pages is default.master & it resides in the 14 Hive > Templates > Layouts folder. 2. The AdditionalPageHead tag ensures the user control code is added to the master page. We can have multiple user controls rendered in this way. 3. The MyAction.xml file ensure the user control is deployed through the WSP file. In this article we have explored a real world scenario. I hope the code will be useful in real word scenarios of integrating Java Script or Custom Controls to every page through solutions. I have attached the source code along with. Error Scenario – Workflow History list not found! In this article we can explore a common scenario associated with creating Workflows in Visual Studio 2010. The SharePoint site at URL is missing a target, task, or history list. Each of these lists is required to associate a workflow template. Please create a list and then launch this wizard. Here I would apply the second solution, using C# code to create the 2 lists. Add the following code to the Main() method. Please change your url accordingly. Execute the above code and if it completed without errors, your problem is solved. Try creating the workflow again and you should not see the error. Inside SharePoint you can verify our new lists as shown below. You can refer the Template Enumeration (SPListTemplateType) here. InvalidType Not used. Value = -1. GenericList Custom list. Value = 100. DocumentLibrary Document library. Value = 101. Survey Survey. Value = 102. Links Links. Value = 103. Announcements Announcements. Value = 104. Contacts Contacts. Value = 105. Events Calendar. Value = 106. Tasks Tasks. Value = 107. DiscussionBoard Discussion board. Value = 108. PictureLibrary Picture library. Value = 109. DataSources Data sources for a site. Value = 110. WebTemplateCatalog Site template gallery. Value = 111. UserInformation User Information. Value = 112. WebPartCatalog Web Part gallery. Value = 113. ListTemplateCatalog List Template gallery. Value = 114. XMLForm XML Form library. Value = 115. MasterPageCatalog Master Page gallery. Value = 116. NoCodeWorkflows No Code Workflows. Value = 117. WorkflowProcess Custom Workflow Process. Value = 118. WebPageLibrary Wiki Page Library. Value = 119. CustomGrid Custom grid for a list. Value = 120. DataConnectionLibrary Data connection library for sharing information about external data connections. Value = 130. WorkflowHistory Workflow History. Value = 140. GanttTasks Project Tasks. Value = 150. Meetings Meeting Series (Meeting). Value = 200. Agenda Agenda (Meeting). Value = 201. MeetingUser Attendees (Meeting). Value = 202. Decision Decisions (Meeting). Value = 204. MeetingObjective Objectives (Meeting). Value = 207. TextBox Text Box (Meeting). Value = 210. ThingsToBring Things To Bring (Meeting). Value = 211. HomePageLibrary Workspace Pages (Meeting). Value = 212. Posts Posts (Blog). Value = 301. Comments Comments (Blog). Value = 302. Categories Categories (Blog). Value = 303. IssueTracking Issue tracking. Value = 1100. AdminTasks Administrator Tasks. Value = 1200. The link is added in the References section too. In this article we have explored a common error scenario associated with workflow creation and a solution for it.